As Jordan Rodgers unearths his family dirt to JoJo Fletcher on The Bachelorette, it's understandable to wonder what NFL player Aaron Rodgers has to say about his brother on The Bachelorette making his private business public. Jordan started being vocal about Aaron Rodgers on the show, claiming to have an estranged relationship with him and the rest of his family to, but Aaron has not openly discussed his family in recent years, and did not respond to Bustle's request for comment on the matter. 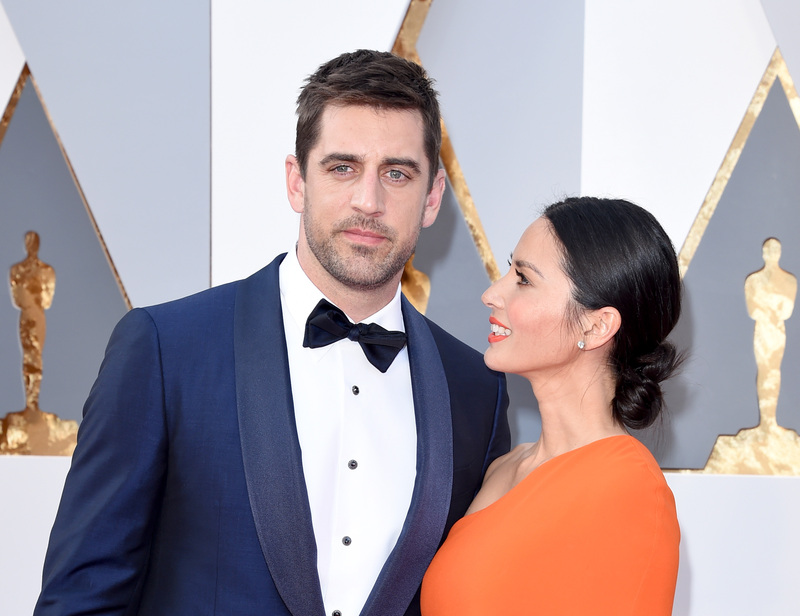 While the Green Bay Packers quarterback is a football star and is in a high-profile relationship with Olivia Munn, that doesn't mean he shares his family history with the media like his younger brother Jordan does. Jordan seemed to condemn Aaron to JoJo in the July 11 episode, telling the Bachelorette that he doesn't really have a relationship with his middle brother and that unlike Aaron, "I chose to stay close with my family and my parents and my brother." According to Jordan's social media, he does have a good relationship with his parents Ed and Darla and his oldest brother Luke, with Aaron nowhere to be found in the photos that Jordan shares on his Instagram. I probably couldn't help myself but to speak out if my sibling was talking trash on me, yet Aaron has maintained the high road (for now) when it comes to speaking publicly about his family. Although I'm as guilty as almost every other Bachelorette fan because I can't help but wonder what exactly went down in the Rodgers clan, I do think the classiest call is to keep your private life private — unlike what Jordan has been doing on The Bachelorette. While there is tons of speculation about the Rodgers brothers after what Jordan said on the show, Aaron has made a habit of not discussing his personal life with the media. In a 2014 interview with the ESPN Milwaukee radio show, Aaron addressed rumors about his sexuality by saying he is not gay, and then followed it up with an explanation about why he doesn't speak to his personal life much. "There's always going to be silly stuff out there in the media. ... I think professional is professional and personal is personal. That's just how I’m going to keep it." And Aaron appears to have stuck with that life philosophy when it comes to his family since I could not find him recently speaking about his parents or brothers in interviews. Beyond this, Aaron really has kept mum (or shall I say Munn?) about his parents and two brothers. However, Munn gave the tiniest bit of insight to Entertainment Tonight back in May while she was promoting X-Men: Apocalypse about her boyfriend and his family. When asked about Jordan being on The Bachelorette, Munn said, "Aaron doesn't really ... I don't think he's really talked with his brother," ET reported. "So, I actually don't know. It's complicated — I'll say that." Many families have complicated dynamics, which is why I think Aaron is making the right call on maintaining his silence about his family. But if you are really craving some insight about the family Rodgers, then the July 18 Bachelorette episode is for you since JoJo will get a firsthand look at Jordan's — and thus, Aaron's — family. And based on the preview for the episode, the topic of Aaron is certainly going to come up once again.